If you’re looking for a complete compendium on all things wood related, then The Wood Handbook may be just what you’re looking for. Subtitled “Wood as an Engineering Material”, this encyclopedia of wood knowledge was written by the USDA Forest Products Division, based in Madison, WI. Best of all, the material is available as a free download, either chapter by chapter or the entire book as a very large PDF file. We have included the updated 2010 version of The Wood Handbook below as a convenient and easy way to download the relevant chapters in a PDF format. Along with each chapter download link, we have added the chapter title and a brief overview of topics from the chapter to give you an idea of what each one covers. This way you can access or download just those parts that interest you. The Wood Handbook includes sections on engineering with wood, timber resources, the structure of wood, physical properties and moisture content of wood, designing with wood, the mechanical properties of wood, wood fastenings, composites, working with round timbers and ties and much more. First issued in 1935, The Wood Handbook is considered the preeminent source of information on wood and wood products. Anyone who works with wood will find this one of the most useful books you can own. You may order a printed copy of this entire publication from the Forest Products Society. The research institution of over 200 scientists at Forest Products Laboratory has provided us with The Wood Handbook -- an indispensable reference work for millions of people world-wide who are woodworkers, design engineers, builders, architects and designers. 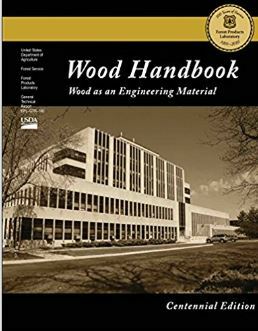 Check out The Wood Handbook for a complete understanding of wood as an engineering material.